The Chinese zodiac compatibility between the snake and rat will have a few differences. But they can be very good together. The snake-rat compatibility is complementary and satisfactory on all fronts. The snake and rat relationship can work out if they overcome their differences. They will have an electric connection and are very responsive to each other’s charisma. If the snake and the rat are in love, they will find it easy to be devoted to each other. 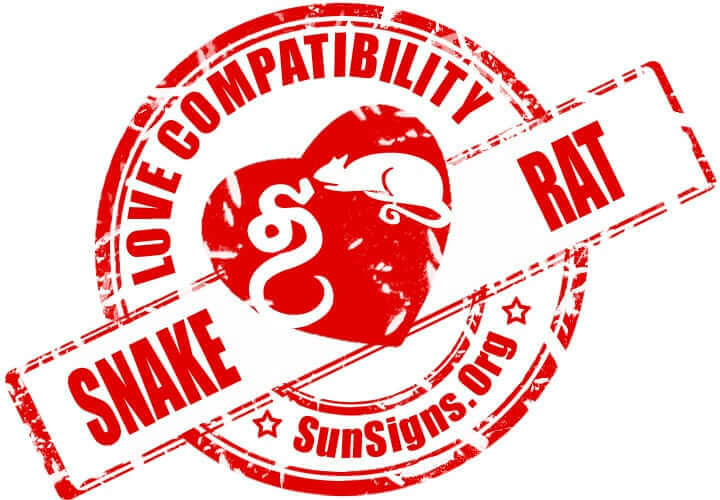 The Chinese zodiac snake and the rat compatibility can make this a great couple. They are both domineering and practical. However, both are more than willing to make compromises with each other. They will especially compromise when it comes to making their relationship stronger sexually in bed. The snake and rat soulmates will have to disregard each other’s differences while dating. Both enjoy material things and want to see results. They are not likely to stop pushing for advancement. They can share a successful and profitable relationship. They have the correct attitude for this and they will also have to agree on where their priorities lie. The rat man or woman will respect the snake for being smart, motivated and careful. They are known for flexibility and being more laid back. The snake man or woman will enjoy the rat’s attitude of concentrating on success and their loyalty. In a snake-rat marriage both will have comparable outlooks overall. However, the male or female rat desires more time alone with their lover. This might not be something their partner can easily provide. Both will be inherently suspicious. Both have issues when it comes to them trusting others. Chinese astrology compatibility predicts that this can be the main reason for a snake-rat breakup. Snake & Rat Chinese Horoscope Compatibility Rated 4 Hearts!